A serial killer is on the loose stalking and murdering young male hustlers and depositing their bodies at New York City riverside locations. The predator displays his prey by reverentially laying out each body like the deceased in a casket and decorates them by placing wrapped condoms in their mouths. Lieutenant Denny Delaney, the celebrated detective who brought down the dreaded terrorist, Felix the Cat, heads the NYPD special ops squad investigating the homicides. Experts school him into the arcane world of johns and hustlers, and Denny gets to know and care for one hustler named Tim who alters his life. Denny’s wife Monny runs a popular web blog and receives scary e-mails from someone who knows far too much about the serial-killer case and the Delaneys’ private lives. This is the third book in the popular series about this Manhattan detective that began with the thriller Nine Lives Too Many. 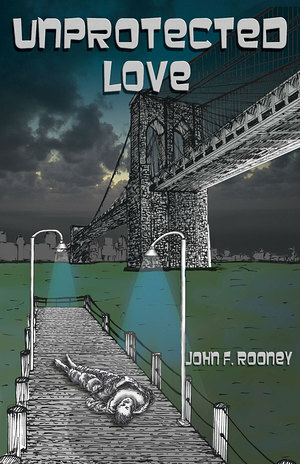 John F. Rooney is also the author of three unique novels set in exotic locations. Get ready for one of Rooney’s absorbing reading odysseys full of surprises, an epiphany or two, and some fascinating revelations into Denny’s libido.